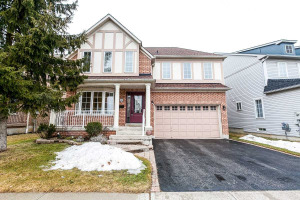 Stunning Home In High Demand Nottingham Community, On A Super Premium Lot W/ No Houses Behind. Main Floor W/ Hardwood Floors Throughout, Fam Room W/ Gas Fireplace, Built-In Home Theatre W/ Surround Sound, Potlights And Crown Moulding. 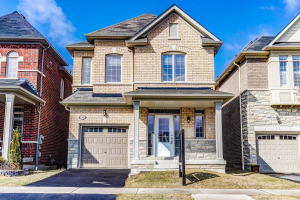 Kitchen Incl Centre Island, Breakfast Bar & W/O To Expansive Private Fully Fenced Backyard W/ Patio, Deck, Playground, Perennial Gardens, Cherry & Pear Trees & New Garden Shed (2018). Close To Shops, Schools, Parks & Much More! S/S Stove, S/S Fridge, S/S Dishwasher, Washer & Dryer, All Elfs Led, 2nd Flr Laundry, Roof (2015), Hardwood (2016), Shed (2018), Quartz Counters (2017), R50 Attic Insulation (2016),Playground. Hot Water Tank Rental. Excl: Drapes Rods.